Schonwald is an Italian duo consisting of Luca Bandini and Alessandra Gismondi. They play an icy brand of shoegaze that is both interesting and distinctive. My research indicates that they release an album named Amplified Nature in 2009, but I've not been able to find much about the album or the group. However, they recently signed with Chicago label HoZac Records, so we're likely to get more music from Schonwald in the future. In the meantime, enjoy this wonderful "Mercurial". The Honey Pies are a group that believes popular music should be fun. And they deliver. The Adelaide, Australia foursome were featured in one of my Midnight World Pop Scout features earlier in the year. They attracted my attention with energetic, well-crafted britpop and their humorous riff on the actor Gary Busey. Today, December 16, The Honey Pies released their second LP of 2011, Carpe Carp. As indicated by the album title and the cover photograph in which the band is decked out in power ranger costumes, their sense of humor hasn't vanished. As for the music, the album is an exuberant collection of Britpop, bar room romps and other slightly twisted versions of recognizable styles, all with harmonies and fun lyrics. Listen to the first four tracks, "Vespa", "Romeo", "Girl", and "My O My O Me O My" at the Bandcamp link below and I think you'll understand why I'm encouraging you to give The Honey Pies a try. The remainder of the album delivers additional songs in the vein of the first four (e.g. "Guy Fawkes Day", another favorite), alt rock ("Henny Penny"), a touch of vamping glam ("I Heart NY" )even a bit of country (e.g. "Houndstooth"). And try "Rubix Cube" for a slice of the lads' semi-sensitive side. The Honey Pies are comprised of Jon Marco (rhythm guitar), Tony Marshall (lead guitar), Tom McCarthy-Jones (bass guitar), and Marcus Warnecke (drums). They enlisted the help of additional players, including horns and a choir, to flesh out their inspirations for the Carpe Carp. By the way, the album is dedicated in loving memory of Australian comedian Shaun Patrick Micallef. My brief research shows that Mr. Micallef is not deceased, so we're not clear on how he feels about this honor. The Soul Corner - James Carr - "Pouring Water on a Drowning Man"
New Stuff: The James Low Western Front "Whiskey Farmer"
James Low grew up in the remote small town of John Day, Oregon, but for many years has lived in Portland where he is one of the stalwarts on the thriving local singer-songwriter circuit. His brand new 8 song CD presents some of the best work of his career. Whiskey Farmer follows the sad trajectory of a character who, as Low explains on his web page: "Has always done things kind of right- did OK in school, went to a generic college, racked up a shitload of debt, and got a job to pay off the debt. He drinks to forget. He alienates the ones who love him best, and just cannot believe that this is all there is to life." Much of Low's previous work is in a roots rock vein, while this is more of a singer-songwriter effort with a whole lot of old school country flavor. Low's highly capable band of 3 years, The Western Front serve the songs well. What I like best about this CD, on top of the outstanding songwriting, is the singing. Low is an experienced vocalist who has gotten far more intentional in his craft over the years. A young guy will throw down some drinks backstage and then just get up there and let it go. But Low is one of those singers who, like Elvis Costello and Joe Henry, as his career progresses, takes every note and tone seriously and brings some real craft to his vocals in tremendous service to the lyrics and emotional weight of the song. And while the songs on Whiskey Farmer are sad and heavy, the melodies and warm musicianship make Whiskey Farmer a highly listenable and enjoyable CD. Producer Mike Coykendall (M Ward, Richmond Fontaine, Blitzen Trapper) gets a terrific sound here. I find myself drawn to this "whiskey farmer" character, concerned about what will happen to him, intently turning the next page as it were to follow his story. These songs will stick with you. I haven't found out much about San Francisco's Pink Films. Admittedly, I haven't gone into stalk mode, but I have some pride. Really, I do. 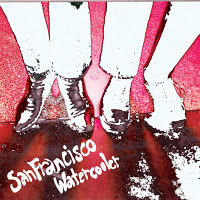 I was able to learn that one of the members of the band is Andy Pastalaniec, who also is a member of a band called San Francisco Water Cooler. The sound is a garagey psychedelia, but has a poppy strain as well. It all sounds promising to me. San Francisco Water Cooler blasts us with chainsaw noise pop with hints of psychedelia. The band rose from the ashes of Santa Cruz's Residual Echoes, and has released three albums of varying length on Sun Sneeze Records. If you like their music, check out the Sun Sneeze Records link below. If you want to check out a few more songs, hit the Soundcloud link. In 2010 they released an LP named Angelic Swells. On January 17, the band is releasing a five-track EP called Shake-A-Baby. And if album track "Wedding Day" is any indication, it is a release to anticipate. Neverever " Coconut Shampoo" from Slumberland Records on Vimeo. We profiled Glasgow band Fiction Faction earlier in the year. We liked their chiming guitars, and their fresh fusion of indie rock and electronic sounds. Some have likened their sound to a somewhat more pop version of The Cure. The gang is back in view with the October release of the Malenky Lizards EP on Glasgow's Saraseto Records. The stable four members of the group (they seem to be looking to add a keyboard player from time to time) are David (Rhythm Guitar, Vocals), Paul (Lead guitar, Vocals), John Paul (Bass, Backing Vocals), and Ellis (Drums, Backing Vocals). The title track is the worthy centerpiece of the EP. Its fusion of pop and indie rock with a hint of blue-eyed soul evokes for me some of the finest moments of Joe Jackson. I've been playing it a couple of times a day for weeks. The second track, "A Lot Can Happen On A Summers Day" has the tone and shading of a Cure song, but with a tempo built for the dance floor. The third track is a Miamoux Miamoux remix of a previously released track, "Apparations". I think it is well done, although I don't consider myself a connoisseur of remixes. The fourth and final track is "Harmonizing the Grateful", which favorably reminds this listener of David Bowie singing vocals for the Soft Boys. Malenky Lizards EP is worth your attention not only because it contains four good songs, but because it promises an exciting things for the future. The band is polished, the vocals are excellent, and the scope of the songs suggest a group willing to reach a bit to create music that means something to them. Dunes are fond of dark pop songs, and are creating a full LP of them for our listening pleasure, to be released in 2012 on PPM. The members of this Los Angeles-based band are listed as Stephanie (aka Stoof), Mark, and Katelyn (aka Beato). They have released an EP on Mexican Summer and a 7" on Art Fag Recordings. Dunes - "Tied Together" from stereogum on Vimeo.